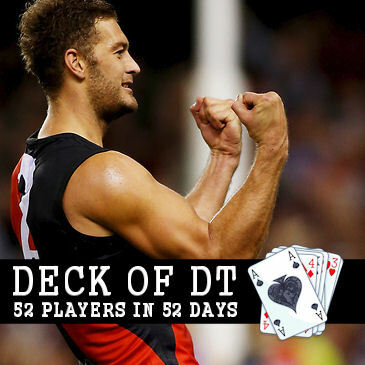 And the final card in the Deck of DT has been turned over and it’s RUC/FWD Tom Bellchambers who offers a lot of value… and flexibility! The the off-season departure of Paddy Ryder, the number one ruck spot at the Bombers is up for grabs and it looks like it has Tom Bellchambers’ name all over it. In 2012, Bellchambers enjoyed his best fantasy year of his career. Playing 16 games for an average of 80.1. This included 7 games over 85 with three of those scores over 110. He backed up in 2013 with 18 games at 73.7 topping the fantasy ton on four occasions. While it is important to see what his scoring potential is, the key in Bellchambers’ fantasy year that number one ruck role (along with some of his durability issues). Last week Wayne Ludbey snapped some shots from Essendon training and the tweet below was an interesting one. Bellchambers, in the Bombers’ playing kit, looks to have it sewn up at the moment. Jonathan Giles was recruited from the Giants to add some depth to their rucks stocks. Giles can play and we all remember – and loved – his debut season for GWS where he pumped out an 81.7 average over is 20 games after starting at just $117,800. Cash cow! Shaun McKernan was also picked up in the off-season from Adelaide. Due to playing just 8 games last year, Bellchambers has been given a discount in fantasy on an already low season average of 54.5. Bellchambers’ price is obviously tasty, but it’s the RUC/FWD status he has that could make him a very worthy pick in your squad. Many coaches are going with the Kreuzer/Leuenberger combo due to their price. At $281,000, you could nearly argue that having Bellchambers on your ruck bench would work, but how about taking advantage of his DPP and sit him at F5 or F6 with the $120,000 American-Pie Mason Cox as a swingman? People are worried about having cover for the rucks and this would provide that. In the world of two trades per week in AFL Fantasy, this may not be such a big deal, however for the limited trade games, this could be a very handy. With only one ruck bench spot now in SC and RDT, this strategy could be a winner. Also, make sure you have him up a fair bit higher in your draft rankings as he should be able to knock out an average of over 80 this year. Injury has crippled Bellchambers throughout his career. He has never played a full year and after an ankle reconstruction in the 2014 pre-season, he was restricted to 8 games. Further surgery this pre-season saw him start full training before Christmas and, wait for it, he’s now burning up the track. While this all looks promising, there has to be some risk about his body. The departure of Ryder should be all positive for Bellchambers, but we are going in a little blind with knowing how he will work with Giles. The NAB Challenge will be interesting to watch so we can get a bit of an idea about how Essendon will use the two big men. …oh and here’s the token ASADA comment. (If any of the Bombers miss games through drug suspension, hello Giles!). Queen – Bellchambers will make us some cash regardless of what role he plays. If he can be the number one ruckman, then those numbers can get up as high as possible. At this stage we have no idea how the ruck combo will work and may not really know even with NAB knowledge. The RUC/FWD swing could be an awesome thing for team structure, but the way a lot of teams are looking, many won’t be keen to spend around the $280K figure on a forward. What will Tom Bellchambers average in 2015? This is the last Deck of DT for 2015. Thank you for reading and being involved in the polls, discussion and fun of what this pre-season has been so far. There’s still a heap of stuff to come on the site with the podcast returning tomorrow and daily content right through! The NAB Challenge starts in less than two weeks. Get excited! Like I warned people on Twitter, Warnie would pick another Essendon player and guess what he did. Not a worthy pick for the Deck? Are my points not valid? Okay… thanks for reading though! Warnie I may pick him up in my forward lines as ruck for Kruzeberger combo. Warnie I may pick him up in my forward lines as ruck cover for the Kruzeberger combo. Not for me, Luey and Kruz have it over this guy in scoring potential, and methinks it will all be a moot point once ASADA strikes. Maximum respect to all the contributors of DODT over the long summer months – the amount of research and effort that has gone into the articles is a credit to all of you. Would be fantastic for next year if it was a true deck (ie 2 of spades through to ace of hearts). I got Bellchambers locked in at F5. Could come in handy if Kruezer or Luey get injured. I can just trade out either one of those two, Throw Bellchambers into the ruck and pick up a new fwd with a low BE. It’s a no brainer! Bell cover trap, Kruez, Leun, cox swing – will catch a few out this year. So many good rookie forwards? I’m hoping kruezer gets dpp round six rendering bellys fwd status irrelevant. Love the deck every year thanks to all the writers. My thoughts on Big Bell, is he will be my first down grade target in round 7/8. Lets just say the Essendon players get suspended for a month (4-5 weeks) he plays 2 games then in round 7-8 right as his price is about to jump trade down berger or kreuzer. Easy 150-200k by that stage if those players average 75-85. Probably won’t happen, but would be nice if it did. Great work putting the deck together fellas. If you are going to have a ruck swingman in SC or RDT, would be Ryder or Lycett IMO. Doesn’t really matter in AFL Fantasy as much.